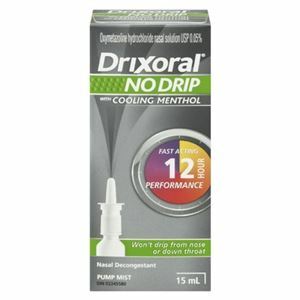 Drixoral NO DRIP with Menthol Nasal Decongestant,Drixoral NO DRIP with cooling Menthol-helps you breathe easier and better! Drixoral No Drip Menthol Decongestant nasal pump relieves the symptoms of nasal congestion, hay fever, sinus congestion and other allergies in a fast and effective manner. It temporarily releives these symptoms and also upper respiratory allergies. Its unique feature of NO Drip microflix technology doesn't let it drip from the nose and keeps the medicine at the congestion site for proper and targeted relief. Other non medicinal ingredients include Benzalkonium chloride solution, benzyl alcohol, camphor, edetate disodium, eucalyptol, menthol, microcrystalline cellulose and carboxymethylcellulose sodium, polyethylene glycol, povidone, propylene glycol, purified water, sodium phosphate dibasic anhydrous, sodium phosphate monobasic monohydrate. Important features include pump mist with menthol that provides fast relief lasting upto 12 hours. Shake the bottle well before use. For first time use, protective cap should be removed and metered pump should be primed. Head should not be tilted while using the spray. The nozzle should be cleaned after each use to maintain hygiene.